Home »Uncategorized»A plan hatched and executed! A somewhat belated post as we are already a month into our trip. We bought our campervan (a Westfalia Columbus 600) last August with the idea of eventually taking an extended break from work and undertaking a tour around Europe. Fast forward to this year and after a couple of months of negotiation my employer agreed to me taking 4 months unpaid leave (well almost unpaid as I’d saved some annual leave and agreed to work remotely for two days a month). We had no real plan, save that we definitely wanted to travel up through Norway to the Lofoten Islands and then down into Europe, likely across the Alps into Italy and then along the south of France before working our way up through France and home. The break also presented itself as an opportune time to complete a Everest Base Camp trip to Nepal I’d twice had to cancel 10 years ago due to cancer. So the outline plan was hatched. – July/Aug/Sept for our Europe vanlife trip, October for a trip to Nepal, and back to work early November. The Europe trip required little planning save for booking the ferry from Denmark to Norway and researching some sites/locations that we definitely wanted to visit en-route. We wanted to avoid campsites (too busy) and major cities (we could do a weekend break) where possible except that we’d need to visit campsites occasionally to do our laundry. We also needed to be make sure that Rosie, our adventure dog (well, she’s a Springador or maybe a Labradinger) was catered for, so we wanted to minimise long driving days and allow for plenty of breaks and exercise. For Nepal, we looked at several different hiking areas/routes but kept coming back to the same feeling that if went to Nepal then we’d definitely want to see Everest. The classic Everest Base Camp trek is a straight there and back affair but there are now a few variations and we settled on EBC via Goyko Lakes, which takes in another valley then crosses a high-pass to reach EBC, before returning via the usual Khumbu Valley . After researching several companies we finally booked through Evertrek (www.evertrek.co.uk) headed by Andy Moore, who thus far has been very helpful. After some last minute buying of bits and bobs for the van we finally left for Europe on the 28th June. Rather than keep my blog updated with our daily whereabouts I’ve been using the Polarsteps app (www.polarsteps.com) to track our travels. Polarsteps automatically logs our route and allows me to append photos and notes as we go. It’s day 30 and we’ve just left Norway which is every bit as stunning as we’d expected and will likely be subject of a separate post. 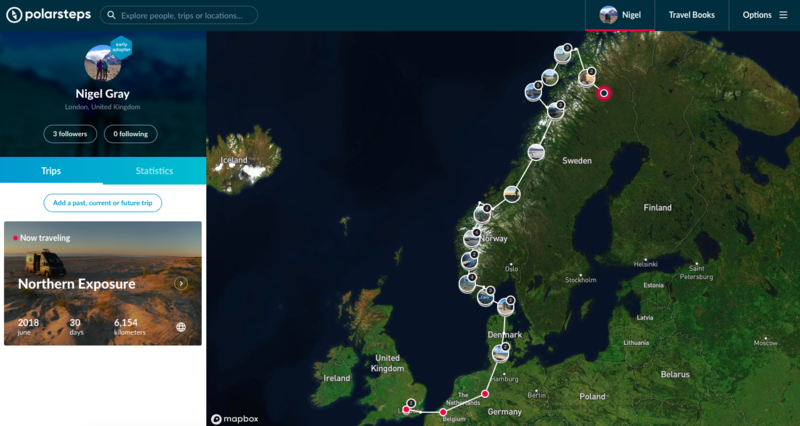 We’re currently in Swedish Lapland – you can follow our progress over the first month and scroll through our route on interactive map by visiting.